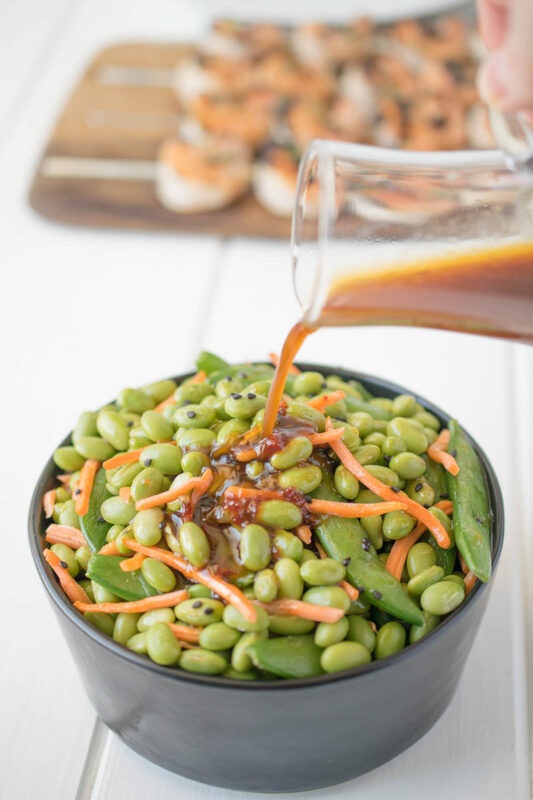 Edamame and Snap Peas with Sesame Ginger Dressing Recipe is well-dressed, full of flavor that is umami inducing. An easy and delicious side dish. I made this salad as part of a complete dinner of grilled miso shrimp and toasted coconut rice for dinner last night after getting inspired at my local Japanese market and the fact that the weather is getting warmer and I’m feeling very spring-like. The entire meal was so easy to whip up, it came together in 30 minutes (after marinating the shrimp). The salad was the first thing on my plate that I devoured and went back for seconds, definitely the star of this show (with the shrimp in a close second). 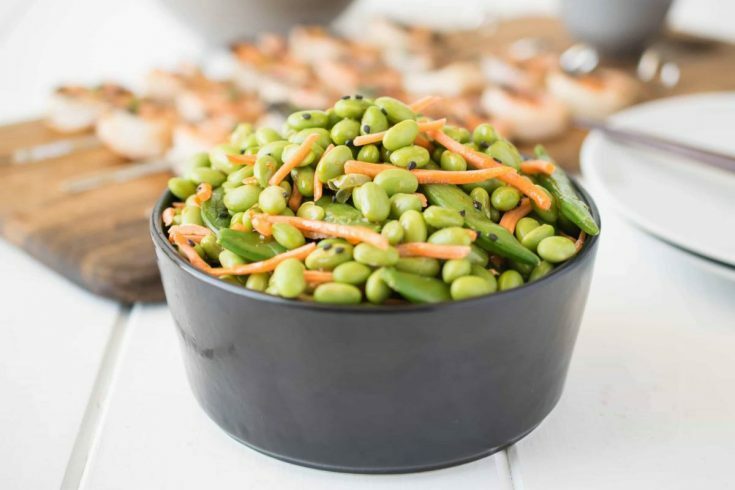 It must be the combination of the creamy edamame along with the crunch snap peas and carrots balanced with the dressing that I have to say, makes this dish. It is perfectly salty, sweet with a tiny little kick from the chili paste. Did I mention that it’s also good for you? I’m sure you know that, I mean it is bowl full of colorful good-for-you vegetables (you know, eat the rainbow). I am going to be enjoying this for my lunch today because the leftovers are amazing. They’ve been bathing in the gorgeous dressing since yesterday, soaking it all in! 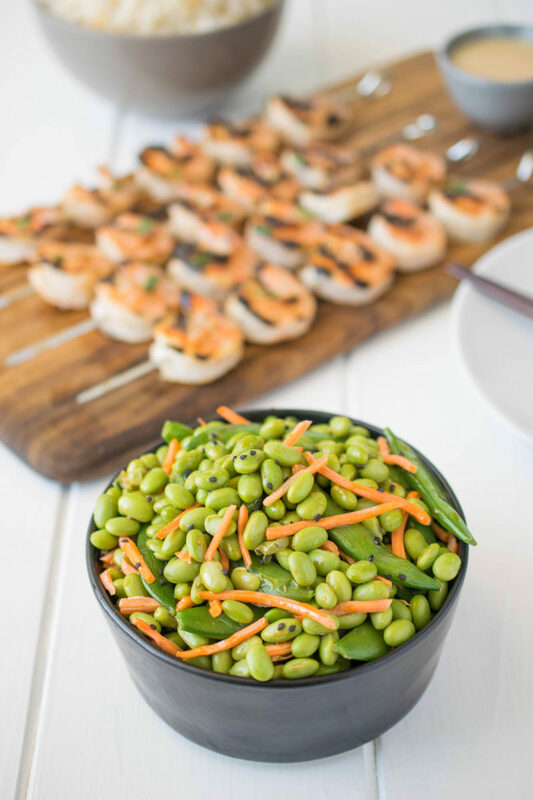 If you’ve tried these Edamame and Snap Peas with Sesame Ginger Dressing Recipe or any other recipe on the blog then don’t forget to rate the recipe and let me know how it turned out in the comments below. I love to hear from my readers! Edamame, snap peas and shredded carrots all dressed in a sesame ginger dressing. To a mixing bowl add the ginger, sesame oil, rice wine vinegar, soy sauce, chili paste and honey. Whisk until mixed well. Set aside. Add ice and water to a large bowl (to cool the vegetables once cooked). Add the edamame and cook for 3 minutes, add the snap peas and cook for 2 minutes. Drain the vegetables and put immediately into the ice water for 5 minutes until cooled. Drain the vegetables, dry and add to a large bowl along with the shredded carrots. Toss with the dressing and serve garnished with toasted sesame seeds. All of my favorites in one bowl! I love everything about this!! sharing every where and making this weekend! Sesame Ginger dressing pushes this right over the top, sounds fantastic! I never had an edamame salad before, but I SHOULD! 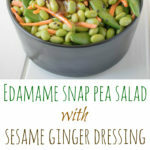 I love edamame and snap peas why not make it a salad so so good. Sounds terrific, it’s a great summer salad with terrific flavors from the dressing. I love the dressing you put with the veggies! This salad looks so fresh and healthy!. I love edamame,chili and ginger. Great combo! 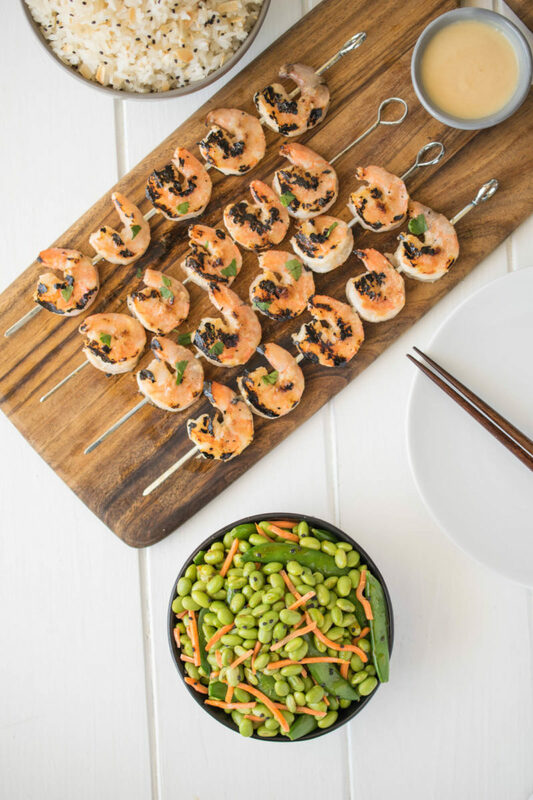 I love simple Asian meals and your edamame and snap pea salad pair perfectly with your grilled miso shrimp! Thank you for a wonderful dinner to add to my summer menus! This looks so awesome! I love all the Asian flavors going on in this wonderful healthy dish. I can’t wait to make this whole meal for myself! Everything about this salad is delicious from the tasty dressing to the crunch and flavors of the vegetables! Love it! This salad would go with so many things, for lunch or dinner. Perfect! Fantastic that you can make this ahead of time. That dressing sounds “to die for”. On my “to do” list for sure. Your marinated shrimp look like perfect outdoor grilling fare. YUM all the way around! This salad looks so good and the salad sounds delicious! Need to try everything, including the rice and shrimp!